Fingerprint Verification for MAGGEY's WinTime Time Clock takes your center to a new level of security. You can forge a name but you can't forge a fingerprint. WinTime now features the latest in fingerprint verification technology. When parents, spouses, other authorized persons, and staff clock in/out their identity will be verified using their fingerprint. Registering your clients fingerprint is done with our custom registration wizard and take only a minute to do. Fingerprint verification is the best form of identity verification available and is very affordable. For more information click here. Standard Wintime can be used on a stand alone computer or on a network workstation. WinTime Verify uses the latest in biometric technology. 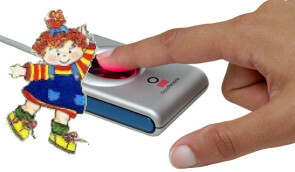 Clients enter their personal PIN, select the children NOT attending that day, and then place their finger on a small fingerprint scanner to verify their identity. Some states will allow a fingerprint verification in lieu of a written signature of attendance. Your staff will also use this verification process when they clock In/Out. WinTime Secure is used for centers that have a separate entryway into their facility or "man trap". The client enters their personal PIN, selects the children NOT attending for the day and presses enter. A relay that we supply as part of the package is triggered will send a signal to your electronic door strike* to unlatch the door. Your staff will also use this verification process when they clock In/Out. WinTime Verify and Secure is the ultimate in security. Clients will enter their personal PIN, select the children NOT attending for the day, and verify their identity via a small fingerprint scanner. A relay that we supply as part of the package is triggered will send a signal to your electronic door strike* to unlatch the door. Your staff will also use this verification process when they clock In/Out. *Electronic door strikes are not supplied with WinTime Secure or WinTime Verify and Secure.